This post is going to be the first of many travel blogs from my recent trip to Iceland with plans to post each blog chronologically following the route I took while driving around the country. My plan with these travel blogs is to depart somewhat from my typical blogging style focusing less on text and more on the photos as some of these locations don’t need to be explained with as much detail as some of the destinations I visit here in Asia. I will however be sure to add some personal thoughts, some travel advice and other related information for travellers. The “Waterfall in Ax River” or “Öxaráfoss” as it is known locally is more than likely going to be one of the first major destinations on every travellers Iceland itinerary. 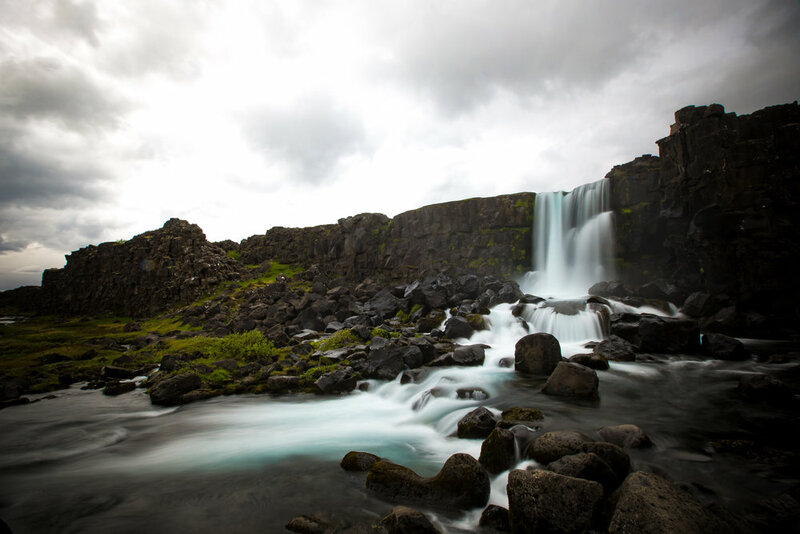 Situated within the beautiful Þingvellir National Park, only a short drive outside of the capital city of Reykjavik, the waterfall is a popular location for both tourists and locals alike. By Icelandic standards, the twenty-meter tall waterfall is a small one in comparison to all of the others you are going to see on your trip - It is however said to be one of the Icelandic people’s most well-loved waterfalls due to its location and for its historical significance. As mentioned above, the waterfall is situated within Þingvellir National Park (Pronounced “Thingvellir”), a designated UNESCO World Heritage Site which has a history dating back to the 9th Century. The park is not only home to Öxaráfoss but also several other (much larger) waterfalls, Iceland’s largest lake and is renowned for its displays of volcanic and geothermal activity. 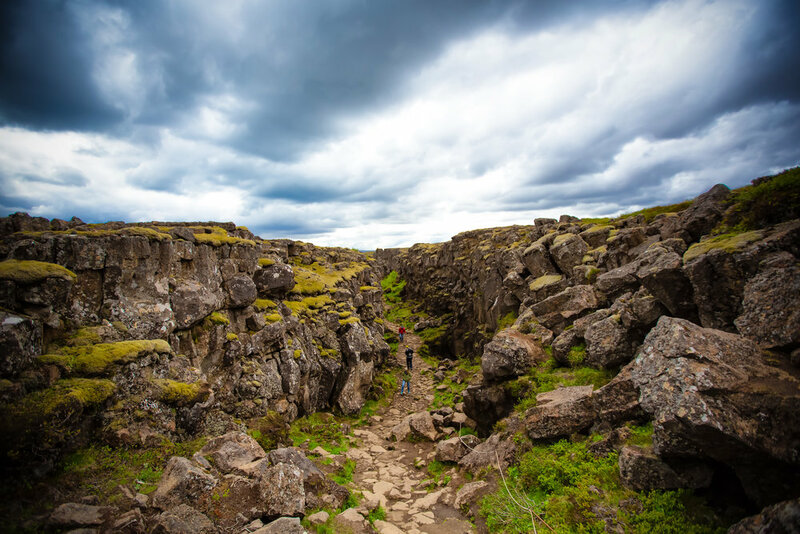 Most notably, the Rift Valley where Öxaráfoss is located is also home to the physical boundary between the North American and Eurasian tectonic plates. 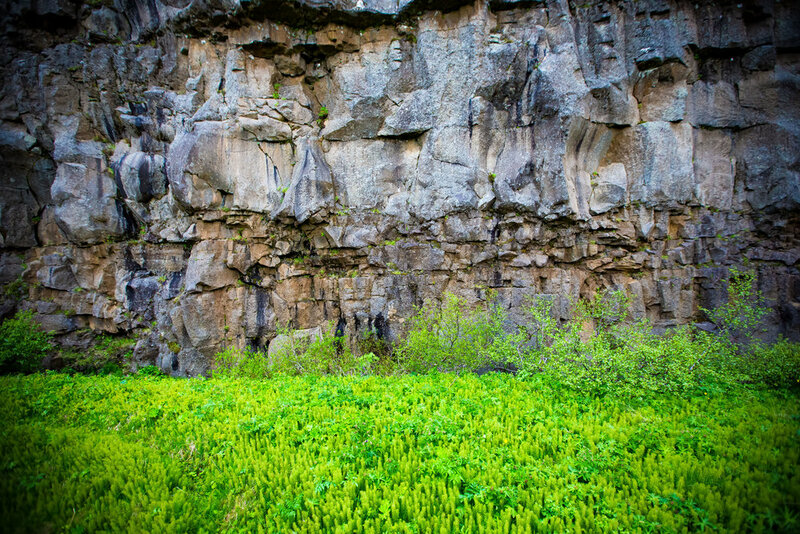 A short distance from the waterfall is the 70-80 meter wide Silfra Fissure which was created by the shifting of the tectonic plates. The fissure is fed with fresh water from the Öxará river and is considered one of the top dive sites in the world offering enthusiasts the rare opportunity to dive between tectonic plates. Conditions at the waterfall vary by season so if you visit in the summer you’re likely going to experience a heavy flow of water thanks to the melting of ice. In winter on the other hand, the waterfall is often frozen making for a completely different experience. As you can see from the photos, the weather on my first day in Iceland wasn’t ideal. The Öxará river which translates into English as “Ax River” gets its name from an Icelandic legend that tells of a troll who had the bad habit of terrorizing visitors to the area before a young hero had enough of it and murdered it with the use of his handy ax. According to the legend the ax, which was lodged deep in the trolls back, floated down the river and was then later found in the place where the waterfall is now. If you’re a fan of the late and great Anthony Bourdain, or have learned anything about the people of Iceland, you’re likely to know that Icelandic folklore can be a bit far-fetched. Belief in elves is a real thing and even though the average tourist probably won’t have a chance to encounter any mystical creatures, it doesn’t change the fact that a large percentage of the population still believes in their existence! What we can separate from myth however (thanks to written records) is that the waterfall wasn’t always there and is a result of human actions to divert the river. Proof of this lies in the fact that there is geological evidence of a river bed due west of the river’s current location. One of the reasons why Þingvellir is so important to the Icelandic people is because the first ‘Icelandic Parliament’, known as the “Althingi” was formed there sometime in the 9th century. In terms of national pride, this is pretty much the place where Icelandic identity finds its origins and is recognized as the oldest continuously existing national parliament in the world. In order to provide water service to the ancient parliament, the Öxará river was diverted in its direction which in turn created the waterfall as the direction of the river now forced the water over a cliff in the Rift Valley. While not a large waterfall, visitors are able to get quite close to the river and it is quite easy to take nice photos of the area which has made it an important stop along the Golden Circle. And yes, I know I haven’t mentioned it yet, but those with a keen eye will know that this area was featured in the popular Game of Thrones TV show as a shooting location. As mentioned above (unless you stop along the road somewhere to take photos), the waterfall is likely to be your first major destination on your Golden Circle trip. If you are driving from Reykjavik, simply take Ring Road Number 1 before eventually turning west on Þingvallavegur Number 36 until you reach the carpark. From the carpark the waterfall is a short (ten minute) walk through the Rift Valley on a well-developed pathway. You could alternatively park your car at the Almannagjá Service Centre and walk through the rift to the waterfall. I recommend the walk through the rift from the carpark though as its quite beautiful and it may seem familiar to Game of Thrones fans. If you have time there is a lot more to see in the area than just the waterfall with hiking paths that will take you to the shores of Thingvellir lake and through the rift. A visit to Öxaráfoss is a great way to get your Icelandic feet wet and is a taste of things yet to come on your journey around the country. The waterfall is small, but it is beautiful and commands the respect of not only the people of Iceland but every tourist that visits!